Roy Keane and the rest of the backroom staff have also agreed to extend their stay. MARTIN O’NEILL HAS signed a new deal to stay on as Ireland manager. Despite announcing a verbal agreement with the association’s chief executive John Delaney prior to the Euro 2016 finals, the Derryman was in the unusual situation where an extension hadn’t been officially tied down going into the latest qualification campaign. However, at this morning’s press conference in Dublin, it was confirmed that O’Neill and his backroom staff have agreed two-year deals that will take them up to the 2018 World Cup in Russia. “I’ve signed it,” said the 64-year-old. “I never saw it as an issue and it wouldn’t have been the first time I’d agreed something and didn’t sign for quite sometime afterwards. “We had agreed a deal way back before the Euros and I never really thought it was an issue. Anyway, it’s signed and done. The former Leicester City, Celtic, Aston Villa and Sunderland boss was linked with a possible move back into club management in recent months, with Hull City believed to be interested, but he insists there was “no reason whatsoever” for the delay. “I might not sound it, but I think John (Delaney) was pretty comfortable when we shook hands on the deal so there was no major reason or stumbling block,” he added. 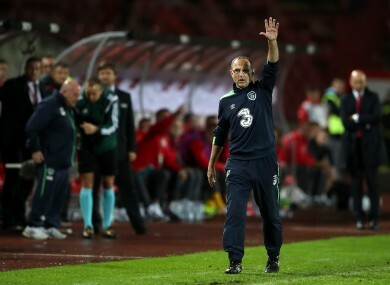 O’Neill went on: “I’m not concerned about what the perception of me is. I’m really too experienced to worry about that. Hedging bets over what? “I’ve signed the contract and we’re delighted to have shaken hands with John quite some months ago. Who knows what happens in life? Ireland’s best chance of qualification for the World Cup in Russia, and I think I’ve proved it, lies with myself and Roy Keane. Assistant boss Keane, along with coaches Steve Walford, Steve Guppy, Seamus McDonagh and the rest of the backroom staff are all on board for the next two years. O’Neill is happy to keep the whole management team together, but says you can never predict what’s around the corner. “I’m delighted that he (Roy) is coming and he wants to do it. Who knows what happens the next day? “We’re in a day and age when contracts don’t really mean anything, and they haven’t for a very long time in football to be perfectly honest. Email “3 months after it was 'agreed', Martin O'Neill has finally signed his new Ireland contract”. Feedback on “3 months after it was 'agreed', Martin O'Neill has finally signed his new Ireland contract”.